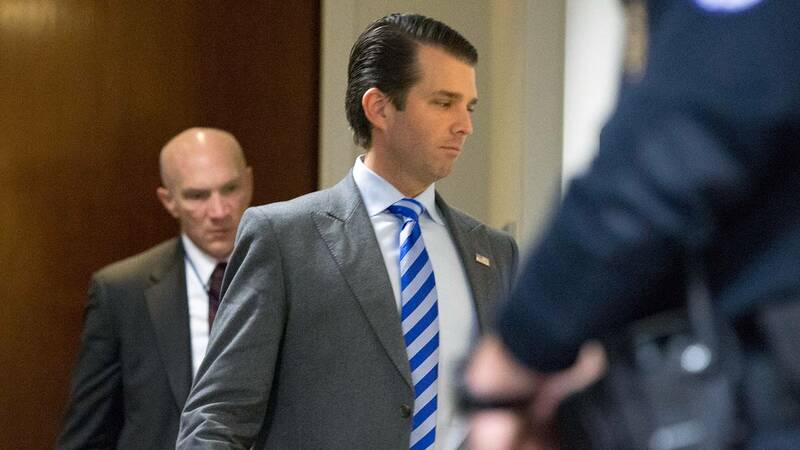 WASHINGTON - Donald Trump Jr. told the Senate Judiciary Committee that he couldn't remember whether he had discussed the Russia investigation with his father, according to transcripts released Wednesday of his interview with the panel. The committee released more than 1,800 pages of transcripts of interviews last year with Trump's son and others who met with a Russian attorney at Trump Tower ahead of the 2016 election. Trump Jr. deflected multiple questions during the interview, including whether he discussed the Russia probe with his father. He also said he didn't think there was anything wrong with attending the Trump Tower meeting in which he was promised dirt on Hillary Clinton. In addition to Trump Jr., the committee interviewed four other people who attended the Trump Tower meeting in New York -- publicist Rob Goldstone, who set up the meeting with the promise of dirt on Clinton; Rinat Akhmetshin, a prominent Russian-American lobbyist; Ike Kaveladze, a business associate of a Moscow-based developer, and a translator. The panel was also not able to interview Jared Kushner, Trump's son-in-law, or Paul Manafort, Trump's former campaign manager, even though both attended the Trump Tower meeting. But the committee released a short page of notes Manafort took on his phone during the meeting. The special counsel is investigating the Russian meddling, whether Trump's campaign was involved and possible obstruction of justice. The Trump Tower meeting, and the administration's initial response to reports of it, has been one focus of the probe.